In February of 1996 an intriguing landscape painting- “View of Bath, NY From the West” came into our lab at WestLake Conservators. Although severely damaged and poorly restored in the past the painting showed a detail and a perspective in the depiction of the distant village and surrounding hillsides that I had never seen before in a 19th C. American painting. The painting was also unusually dark in the foreground from a staining coming up from underneath the paint layer and there appeared to be original wrinkling and shrinking of the ground layer indicating the possibility of a photo sensitive ground. This painting looked like a very accurate and important historical record of the time and place and its detail was amazing. The owners of the painting, The Stuben County Historical Society, Richard Sherer, Historian and Ronald J. Wyatt, Volunteer Curator, of Bath, NY, wanted it cleaned and repaired so that it could be photographed for publication. Unfortunately the costs of reversing the early lining and poor repairs, including heavy overpaint through the sky, were prohibitively expensive at the time so the painting was only “restored” digitally for the publication. But a thorough examination of the painting was undertaken revealing a clear inscription on the stretcher bar reverse reading: “Painted by A. J. Russell Esq. For Robt. VanValkenberg Oct. 2nd 1859. View of Bath from the West.” — So who was A. J. Russell?? Four years later another panoramic view of a Central New York village entered the lab, this time from Bradley Mitchell of the Howland Stone Store Museum. 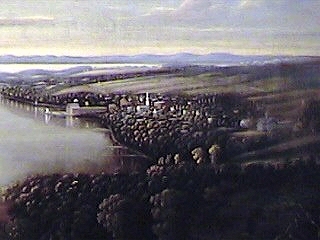 It was similar in size and perspective as the “View of Bath” and was inscribed on the reverse “Cayuga Lake from Pumkin Hill, 1856” – the village in this picture being Aurora, New York. This also had a fine wrinkling through the ground layer and a dark staining in the foreground and it immediately reminded me of A. J. Russell’s “View of Bath”. Interesting – so I started doing a little research on Russell and did not find him listed as an artist in any of our reference books. However a search on the internet produced an abundance of information on the 19th C. photographer – A. J. Russell. “Andrew Joseph Russell (1830-1902) USA- Andrew Russell grew up in Nunda, NY. He displayed artistic abilities and taught penmanship in the Nunda public schools, then left for New York City to open a painting studio. He learned photography in New York, and used it for preliminary sketches for his paintings. He displayed paintings based on photographs during the early 1860’s. In 1862 Russell enlisted in the 141st New York Volunteers, then he was assigned to the U.S. Military Rail Road Construction Corps, under General Haupt. Russell documented the bridge building activities, rail road construction techniques, camps and supplies of the Corps. He also photographed troops, battlefields and combat aftermath scenes. His work provided some of the most coherent documentation of the war and some of the most beautiful photographs of the new technologies of transportation. Russell photographed at Marye’s Heights during the battle of Fredricksburg, at Petersburg, Alexandria, and the fall of Richmond. After the war Russell was hired by the Union Pacific Rail Road to document the construction along the line of track as the road was built across the country. Russell led a crew of photographers …which again created an extraordinary group of documents of a major event in American history. 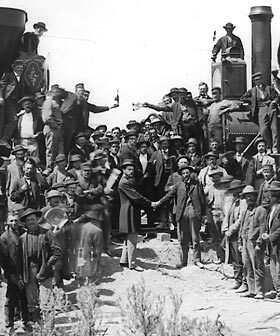 Ironically, his photograph of “The Joining of the Rails” at Promontory Point, Utah was misattributed to C. R. Savage for years. The Joining of the Rails – the “Champagne” photo. So he was a painter first and “based” his paintings on a photographic process. There is no further record that I know of regarding any more of his early paintings. 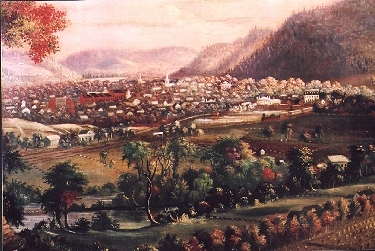 It would appear that he traveled through the Central New York Finger Lakes district in the late 1850’s taking photographs of towns from a distance and then painting on top of the image gotten onto the canvas. He seems then to have have had a show of his landscapes in the early 1860’s. If anyone has any information on more of his paintings I would greatly appreciate hearing from you. “View of Bath From the West” by A.J.Russell was restored along with its period gilt frame in 2002. 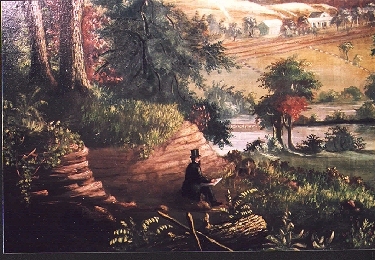 “The View of Cayuga Lake from Pumkin Hill 1856” was given a complete conservation treatment in 2001 and it is owned by the Howland Stone Store Museum (Sherwood), Aurora, NY. The painting was donated to the Howland Stone Store Museum by Patricia Howland White, Faith Howland Rick, and Susan Howland Crumrine. 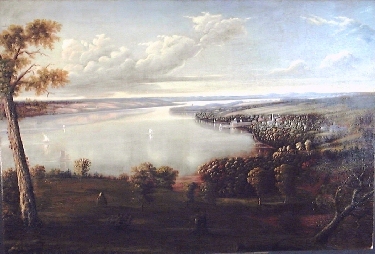 Conservation of the Aurora painting was funded by the Cayuga Lake National Bank of Aurora, NY. 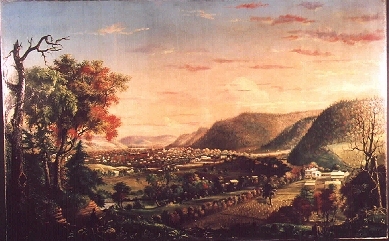 The View of Bath measures 27″h x 42″w and the View of Aurora measures 27″h x 40″w. – both are oil on canvas paintings. Anthony’s Photo Bulletin, July 1882– Capt. A. J. Russell writing about Civil War Photographers.